From its vista, you may envision that the Montreux Riviera is a quietly picturesque township, yet it is a vibrant city and home to a number of attractions and events that are world-renowned. If you can appreciate a glass or more of the finest wines available in Switzerland, then a trip to the neighboring Vineyard Terraces in Lavaux is in order. Listed as a UNESCO world heritage site since 2007, the Vineyard Terraces contain a multitude of wineries for you to visit. Due to the different soils and microclimates of the vineyards, the result is an incredible variation of flavors of wines to be sampled and purchased. With high quality wines available such as the Chardonne, Epesses, Dézaley and the St. Saphorin, you will find it difficult not to buy them all. Take a day to explore this wine region and discover which cellars are open in the area. The Rochers-de-Naye is a mountain of the Swiss Alps towering 2042 meters above Montreux. To witness the incredible view over Lake Geneva and its surrounding areas, take the Montreux-Rochers-de-Naye cog railway and in less than one hour you will reach the summit station. From there, you will have a short walk in order to reach the summit of the mountain. Embedded in the rock face is a panorama restaurant called Plein-Roc. Other attractions include botanical gardens, a marmot park and a climbing garden. The inaugural edition of the Montreux Jazz Festival was held in 1967 and since then it annually welcomes the greatest names in jazz, blues, rock, soul, world music and more. Held in late June through mid-July, the festival receives approximately 150,000 visitors and is the second largest annual jazz festival in the world. Besides enjoying live performances, fans can mingle with artists and take in jam sessions at the Montreux Jazz Café. In conjunction with the Café, Montreux Sounds features the largest collection of audio and visual recordings of musical performances in the world. On a day when you would rather enjoy the city itself, take a stroll on the lakefront promenade. During the months of May to December, you will discover exotic flowers and trees, an artistic array of vegetal sculptures along with the breathtaking view of the Alps. The promenade extends along the shoreline for nearly 7 kilometers from Montreux to Vevey. Archaeological excavations record that the site of the Chillon Castle was occupied since the Bronze Age. 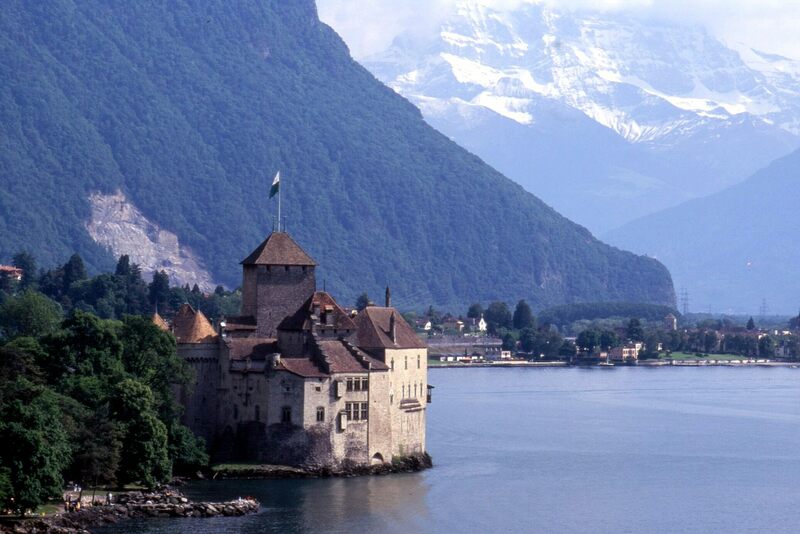 The inhabitants of the Castle during the 12th to 16th century collected tolls and controlled the trading route of Lake Geneva and the roadway of the St. Bernard Pass. Chillon Castle also served as a fortress and prison for over 260 years when the Bernese conquered the region and took possession of the castle in 1536. It now serves as a city landmark, popular tourist destination and a local space to host events and exhibitions. My favorite city in Switzerland is Lugano. I have a couple of friends who live in that region so I was able to stay at their house for free. It was FABULOUS! But, Switzerland is basically pretty fabulous. I never visited Lugano however I intend to return to Switzerland one day so I may put that city in my travel itinerary. Thanks for the suggestion! Sold! That sounds like a lovely trip. I’ve never been to Switzerland, but the Alps have always been appealing to me. Who would have thought you could find such a huge jazz festival there? Actually it was the Montreux Jazz Fest in part that brought me to Switzerland! I was a vocalist for one of the performing acts at the festival a few years ago and I fell in love with Montreux! Sounds like a great place to visit, will definitely keep it in mind in case I ever head back to Switzerland. Sounds like a good plan and I know you won’t regret the stopover if you do Catherine. Kassandra, you make Switzerland sound so picturesque and inviting, I want to go! As I live in London I should go as it is only about 2-3 hour journey. Perhaps when I have cleared my debt….. Visiting Montreux sounds like a fabulous way of celebrating your impending debt freedom Victoria! Enjoy a nice ride on the Eurostar while you’re at it! I would love to go to Switzerland and compare the Alps to the Rockies. I’m sure the off the beaten path places are the most special ones. I’ve flown over the Rockies but I have yet to visit there. I have it mind to one day journey across Canada by Via Rail and visit each province. I won’t have enough of a lifetime to truly see the world as I would want to. Ok…where do I sign up!! Thanks for this Kassandra and take care. We have budgeted a trip to Europe (my first) in a couple of years which will include Switzerland so I will make note of your Montreux Riviera tip. Thanks! Congratulations on your upcoming voyage to Europe Tommy. If you can allot some time while in Switzerland, a stopover in Montreux will be worth it, I promise! I’ve never been to Switzerland but my son has. That pic with the mountains in the background looks divine! When I was in Montreux I stayed in a villa 1000 metres above sea level. I was mesmerized by the view each morning and it’s still a vivid memory for me.